Mansoureh was born into a middle-class family and was the second among six children. She was always serious with a lively, brave, and strong personality. She was a kind, friendly, and social girl while also independent and ambitious. Mansoureh was energetic, free spirited and passionate for life. She enjoyed hiking, running, and volleyball. Her final year in high school coincided with the anti-monarchic revolution in 1979. She was very enthusiastic about social and political issues as she strived to achieve her aspirations of freedom, justice, and equality. She used every opportunity to defend women’s rights and the revolution provided her the opportunity to challenge the rigid traditions of the past. Her rebellious spirit propelled her to oppose the mullahs’ misogynist views. Mansoureh began her activities with various student associations shortly after she became acquainted with the opposition People’s Mojahedin Organization of Iran (PMOI). She was admitted to the Teachers’ Training College, however, the university’s authorities did not like Mansoureh’s social and political activities and expelled her within a few months. After learning of her dismissal, she went directly to the Minister of Higher Education’s office and condemned this unfair act. Subsequently, she continued her social activities among workers. First, she got hired at a porcelain workshop and then started working at a pharmaceutical factory. Soon after, she began cooperating with the PMOI’s Workers Association. Following the mass arrests and daily executions that began on June 20, 1981, Mansoureh’s activities had to be carried out covertly. She and a number of other brave girls decided to burn Khomeini’s photos during a demonstration on September 27, 1981. Mansoureh courageously directed this act of protest and, despite the presence of police and military, escaped the scene, skillfully. She was arrested on November 16, 1981 and immediately taken for interrogation. Mansoureh was never intimidated by her torturers. Although she was whipped by cables, she endured the pain and never betrayed her compatriots. She had told everyone who had got arrested with her to blame everything on her so they would get lighter sentences. Mansoureh was eventually released in 1986. 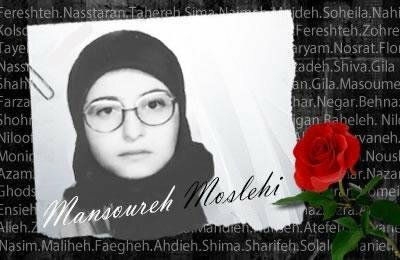 Her freedom was another opportunity for her to reunite with the PMOI. She knew that in order to join the resistance she had to leave the country and go to Camp Ashraf in Iraq. Unfortunately, she was arrested at the border and directly sent to Evin Prison. This time, Mansoureh resisted the tortures and solitary confinement even more courageously. Her inmates don’t recall a moment of despair, frustration, or fatigue in her face. Her high spirits and determination were always inspiring to other inmates. Sadly, Mansoureh and thousands of other Mojaheds were hanged during the 1988 massacre. Khomeini’s fatwa did not spare anyone who maintained adherence to the struggle for liberation of Iran. Mansoureh chose to defend her cause for the liberation of Iran’s women and the liberation of her compatriots. She thus joined the galaxy of over 120,000 shining stars who gave their lives to bring freedom, justice and liberation to everyone.